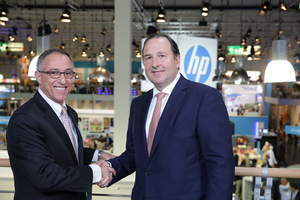 DUSSELDORF, GERMANY--(Marketwired - Jun 6, 2016) - Today at drupa 2016, HP Inc. (NYSE: HPQ) announced that Smurfit Kappa, a world leader in paper-based packaging solutions with over 100 converting plants in Europe, has entered into a strategic collaboration agreement with HP to further develop the recently announced digital corrugated post-print solution, the HP PageWide C500 Press. "Smurfit Kappa is dedicated to delivering customer growth through innovation. While our current digital printing solutions enable us to offer our customers fast time to market and shorter runs, we required a more robust and economical solution to scale our digital printing capabilities," said Roberto Villaquiran, CEO Smurfit Kappa Europe. "After a thorough analysis, we determined the HP PageWide C500 Press is the most compelling digital end-to-end solution for corrugated post-print, and HP is the right vendor with the right commitment to innovation in this space to help us reinforce our leadership. This partnership will help us continue innovating and grow together." Poised to become a digital powerhouse, Smurfit Kappa will collaborate with HP to revolutionize the way high-value boxes are produced. With the HP PageWide C500 Press, Smurfit Kappa will be able to print direct-to-board with quality to substitute lithography, deliver faster turnarounds with just-in-time production and acquire new customers by leveraging on-demand services and unmatched production flexibility. The company will work closely with HP to develop the new press, providing unique production insights into the specific requirements for corrugated post-printing, and plans to roll out the new solution in its European plants. "Smurfit Kappa was looking for a proven technology provider with an economical solution and a long-term vision to address traditional production challenges and limitations," said Mike Salfity, general manager and global head, HP Graphics Solutions Business, HP Inc. "The company placed its confidence in HP, securing an early-adopter advantage and HP has now gained a mentor to perfect the HP PageWide C500 Press and continue the digital transformation in the corrugated packaging market." Leveraging 30 years of HP Thermal Inkjet innovation and powered by proven HP PageWide Printing Technology, the HP PageWide C500 Press offers a flexible and robust industrial post-print corrugated solution that delivers high-impact, offset-quality graphics direct-to-board, enabling customers to affordably adopt digital technology and reinvent a segment ripe with opportunity. The new press is designed to seamlessly integrate into any production environment, from large integrated converters with centralized and distributed printing, to small, independent converters. The press also features the proven HP Corrugated Grip Technology, helping customers expand media versatility and enhance production flexibility with the ability to handle a wider range of media from the lightest micro-flute to the heaviest double wall board. Additionally, new water-based HP inks are designed for printing on the non-contact surface of paperboard packaging, complying with global food safety regulations and industry guidelines,1enabling customers to achieve food-compliant packaging required to support packaging campaigns for leading food brands. The HP PageWide C500 Press joins HP's growing portfolio of digital packaging solutions from thin films to cartons and corrugated, all providing converters with new opportunities to increase productivity and profitability while satisfying dynamic brand requirements. Visit the HP drupa 2016 online press kit for more information and to follow HP's drupa news. More information about the latest HP corrugated packaging solutions is available at www.hp.com/go/packaging. Product videos and updates are available on Facebook, Twitter, YouTube and LinkedIn. Add your voice to the #drupa2016 conversation, and share your analysis of the new HP corrugated solutions and their potential for customers by adding the #ReinventPossibilities hashtag. (1) The ink is intended to comply with the following US & European regulations and industry guidance: US FDA 21CFR parts 170-199, EU Framework Reg'n 1935/2004/EC, Article 26(i) of the Swiss Ordinance 817.023.21, EuPIA Guideline on Printing Inks 2011 (& EuPIA Guidance 3rd Revised Version for GMP), Nestle guidelines (2014), EN 1230. The customer is responsible for determining food packaging compliance of the final packaging article; HP can provide information about relevant OPV candidates to assist in that determination. (2)Availability is subject to change and may vary by region. This press release contains forward-looking statements within the meaning of the safe harbor provisions of the Private Securities Litigation Reform Act of 1995. Such statements involve risks, uncertainties and assumptions. If such risks or uncertainties materialize or such assumptions prove incorrect, the results of HP and its consolidated subsidiaries could differ materially from those expressed or implied by such forward-looking statements and assumptions. All statements other than statements of historical fact are statements that could be deemed forward-looking statements, including any statements of expectation or belief and any statements of assumptions underlying any of the foregoing. Risks, uncertainties and assumptions include the possibility that expected benefits may not materialize as expected and other risks that are described in HP's Securities and Exchange Commission reports, including, but not limited to, the risks described in HP's Annual Report on Form 10-K for its fiscal year ended October 31, 2015 and HP's Quarterly Report on Form 10-Q for its fiscal quarter ended January 31, 2016. HP assumes no obligation and does not intend to update these forward-looking statements.